As Netflix rolls out its latest round of price increases to current subscribers, any backlash could be a lesson for Apple and others entering the streaming market. If you're a Netflix subscriber, that charge on your credit card might be a little higher next month. The streaming giant announced another round of price hikes in January, and they're going into effect now or soon -- on May 1 for many current subscribers, though the exact timing of the price increase will depend on your billing cycle, a Netflix (NFLX - Get Report) spokesperson clarified in an email. Netflix started notifying current subscribers of the coming increases on Monday; new subscribers that signed up after the increases were announced in mid-January had to pay the higher rates immediately. Netflix shares were up 2% on Monday and are up 37% so far this year. The question now is: How much do Netflix subscribers care about price hikes -- and how much pricing power does the company have left? The latest round of increases boosts the price of its Basic plan to $9 from $8 per month, while its most popular Standard plan will go up to $13 from $11 per month. The Premium plan goes up to $16 from $14 per month. The price increases were mostly well-received by Netflix investors, partly on the idea that the new prices could add as much as $1.5 billion to Netflix's top line. But there are signs that Netflix could encounter some resistance to further increases. A recent consumer survey from The Diffusion Group, which was conducted in December 2018 prior to Netflix's latest price hike, found that 16% of total respondents said they would either downgrade or cancel their Netflix plans if it were to go up by $1 a month. The Diffusion Group's president, Michael Greeson, said that while the survey results aren't predictive, they help to illustrate that even for incumbents like Netflix, raising prices does come at a cost. "It may begin as small drips of subscribers downgrading or cancelling, but over time the price will reach a ceiling beyond which growth will be difficult," Greeson explained. That's a trade-off for higher revenues that Netflix is willing to make -- but as more streaming services like (AAPL - Get Report) Apple's TV+, Disney's planned streaming service and others enter the market, that equation could get a bit more complicated. 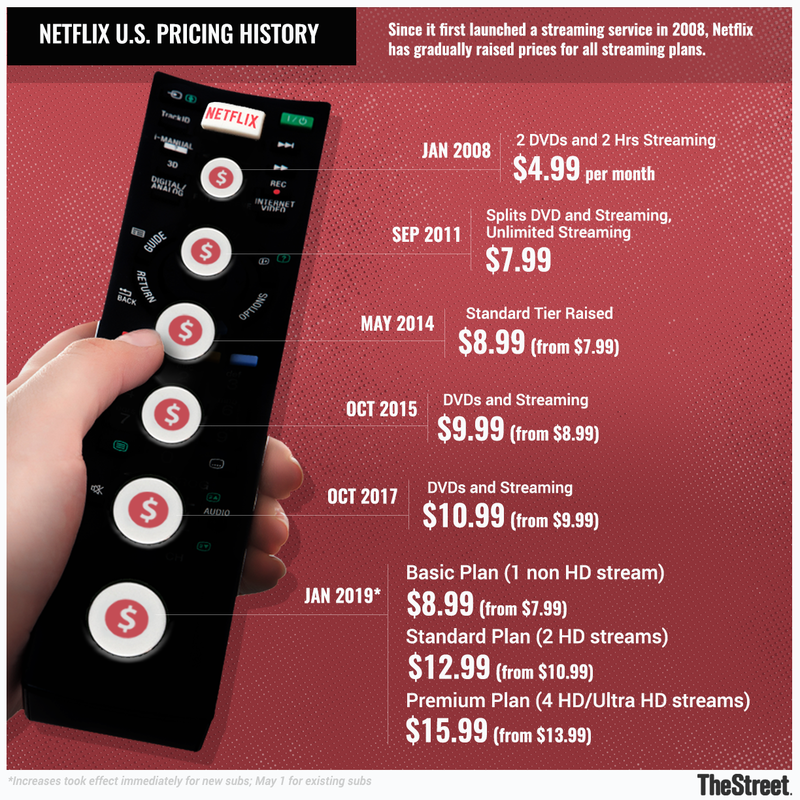 And any backlash to Netflix's price increases could also provide clues to how newer offerings could -- or should -- be priced. "With the arrival of new big-named competitors in the [subscription video on demand/direct-to-consumer TV] space, we're about to learn a lot about price ceilings and floors for these services," Greeson added. "Much will depend on the composition of the new services (e.g., just how much content Disney packs into its subscription) relative to their cost. If Disney comes in around $9/month and offers a robust library and slate of originals, that will make it more difficult for Netflix, a bit less so for Hulu due to recent price decreases." Neither Disney (DIS - Get Report) nor Apple has revealed pricing for their streaming services, but Greeson added that it will be very difficult for Apple to charge a "premium" price -- that is, higher than Netflix's -- for its TV+ offering. "There will be too many less expensive alternatives in market to get away with it," he added. Apple and Disney are holdings in Jim Cramer's Action Alerts PLUS member club. Want to be alerted before Jim Cramer buys or sells AMZN or DIS? Learn more now.